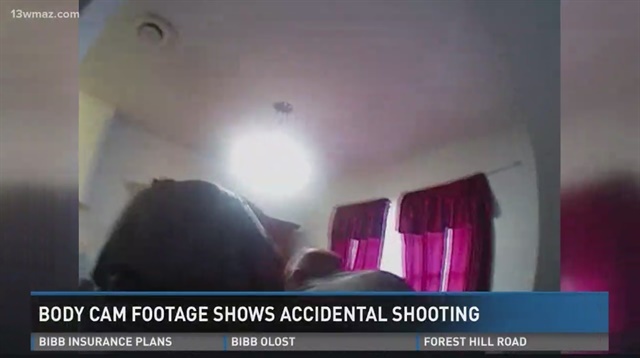 Video: GA Deputy Shot Man After Announcing He was Deploying "Taser"
Body cam video released Tuesday by the Georgia Bureau of Investigation shows the moment Baldwin County Sheriff's deputy Charles Gillis shot 18-year old Jamel Jackson in the arm. The video shows that the deputy may have drawn and fired his gun while intending to deploy an ECW. It happened last Monday in an apartment complex, after Jackson allegedly got into a domestic dispute with his mother. According to the incident report, Gillis and another deputy tried to arrest Jackson, but he resisted and a fight broke out. In the video, you can hear a deputy yelling "Taser, Taser!" Baldwin Sheriff Bill Massee told WMAZ that Gillis made a mistake, pulling his gun instead of his Taser to restrain Jackson.